Summary: Light rain on Tuesday and Wednesday, with high temperatures bottoming out at 63° on Tuesday. 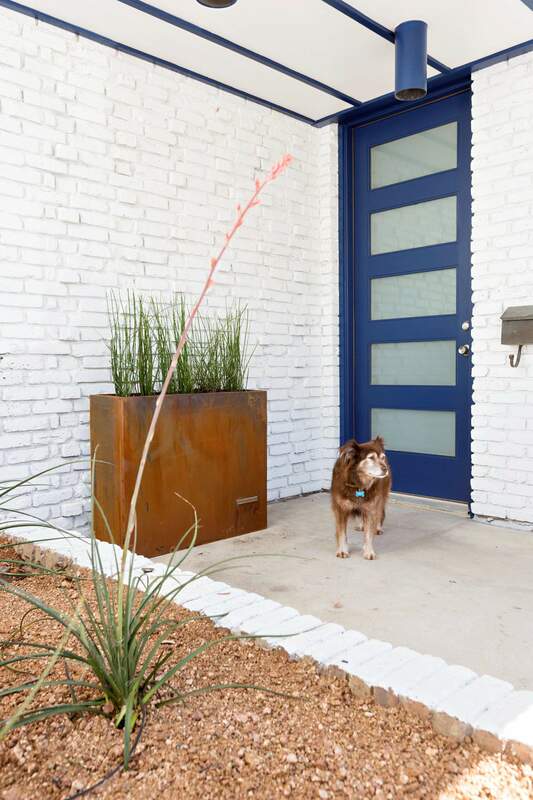 A bold blue door set against crisp white which creates a cheerful atmosphere in this front entry area designed by Abbe Fenimore, founder of Studio Ten 25 in Dallas. The delicate leaves and flowers of potted flowering plants creates a perfect balance with the architectural molding and a dramatic black front door at this entryway designed by Abbe Fenimore of Studio Ten 25 in Dallas. 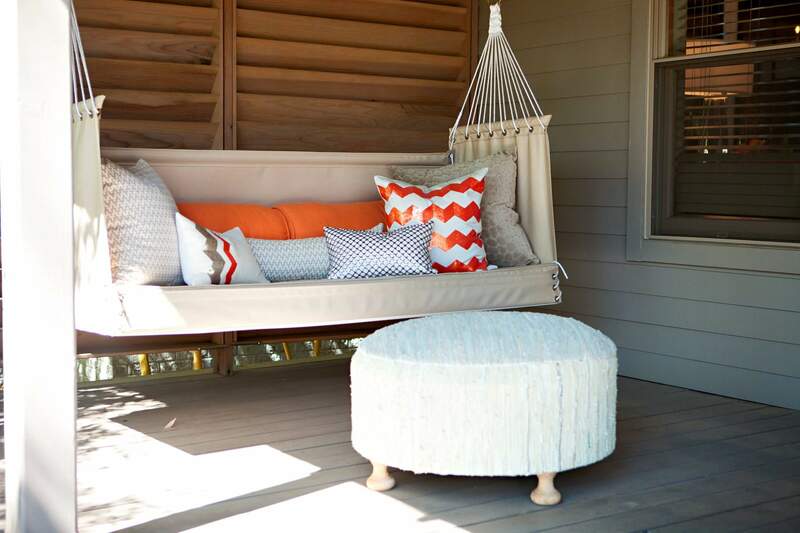 Sofa pillows, as seen in this outdoor seating area designed by Texas-based interior designer Abbe Fenimore, bring a touch of indoor comfort to a deck or patio. If a front porch has enough space, comfortable seating like this can create the feeling of an outdoor room. NEW YORK – Interior designer Joan Craig sees many clients who give the decorating of their living room or kitchen a lot of thought. And even if you give your backyard patio or deck some decorating attention, the front entrance often remains an afterthought. 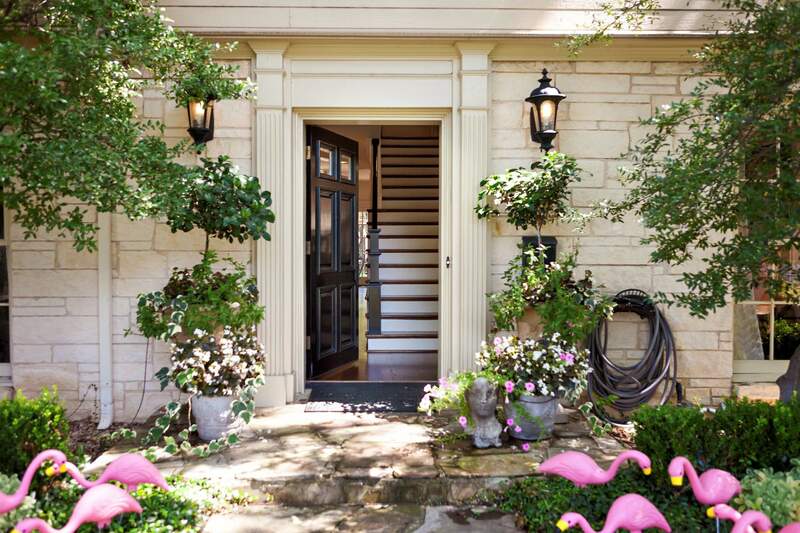 In this season of outdoor entertaining, we’ve asked Craig, Czajkowska and Dallas-based interior designer Abbe Fenimore for advice on creating the most welcoming front entry areas. Step backIt’s hard to assess your front-door area when standing right in front of it. A home’s entrance area begins where the visitor can first see it, says Craig, so stand at the road and consider your home from that distance. That may inspire you to embrace larger, more dramatic items. “Pump up the scale of lanterns on either side of the door,” Craig says, or go for dramatic containers for planting. Or stay with simple planters, but put dramatic plants in them: “Even if you have a small container,” Craig says, “it can have an incredible climbing rose coming out of it.” She also suggests Boston ivy or climbing ivy. Fenimore likes porch swings, which don’t have to take up much space and are welcoming. A simple canvas seat cushion matched with indoor/outdoor pillows can create a perfect space for reading or having coffee in the morning, she says. Outdoor seating offers not just a spot to relax, Czajkowska says, but can double as a place to rest your bag while searching for keys. It may even be worth investing in an expanded porch area to make space for seating, Fenimore says. She remodeled her own front porch to create a sitting area. Dark front doors painted black or charcoal have also become popular and work well on some houses. Craig and Fenimore agree: Sweating the details can pay off handsomely.